it came rushing in, that great rare blast of happily-ever-after, so especially delicious in these long days of murky darkness that swirl and swirl around, almost without pause. the world, downright hungry for a delicious morsel, after all the bitter banquets–wars, tsunamis, mile-wide twisters. i had a hunch i’d not pass up the chance to swoon, to tear up, alone in the dark, connected by a lit-up box, to a place, a spectacle, so very far away. and so, when the cat obligingly meowed at 3-something, i ripped back the covers, and tiptoed right behind. i saw the moonlight draped across my garden; i noticed out the window, candles twinkling from the wall of windows in the house next door. i was alone, but not alone at all. i clicked on the telly, wrapped a wide wool blanket ’round my chilly legs. i settled in, knowing just next door the house was filled with silver-haired ladies, anglophiles all, gathered in their wedding finery, sipping fizzly drinks, sinking teeth in strawberries. at 3:20 in the morning. i waited while i watched the royal cars queue toward the abbey. i remembered back to the last time i was awake to watch westminster, the sad dark day in 1997 when they buried another princess, the mother of this handsome groom, this boy we’ve watched grow up. oh, i know it’s all quiet sappy but isn’t it the prescription that we need to fill our lungs, trigger just a bit the heartbeat, stoke again our dreams of love and solid footing, and waltzing toward the sunset? i’ll take it, drink it, press it up against my pajama-clad flat chest. oh, i admit, i’ve been one for fairy tales my whole life long. always root for endings that make me misty-eyed and get my heart pumping surely, strongly, the steady percussion of promise just around the bend. i love to watch a great romance, stoked in youth on those rare nights when i was invited in by my mostly-stoic mama to stay up late, and watch till the very end, some gauzy-filtered hollywood version of happy-ever-after. i’d glance over, on those sweet nights, catch my mama brush away a tear as i brushed away my own. a sweet shared lump in the pit of our incurably romantic throats. it made me understand that my mama was so much more than just the one who scolded me for hiding all my peas beneath the rim of the dinner plate, or not picking up my clothes. it was the rare glimpse beyond all that, and perhaps in large measure that’s why i hold those happy-ever-endings so deeply dear. i’ve always been insatiable in the S.A.P. department. back when i was little, and full of dreams, i’d read myself to sleep many a night, turning pages in my fairy-tale picture books, absorbed into the pictures, writing my way into the script. imagining. imagining. the birthing, really, of a life spent peering through a rosy lens. of keeping watch for the ruby slippers that might slide on the smudged-up cinderella, who so deserves the pumpkin carriage. and isn’t it now a much-needed dose of cast-aside-your-cares? the cares upon us all these days are thick and deep. the worries bend our brow, stoop our shoulders, make our ankles wobble. we have worries aplenty. nights we lay awake, playing and replaying the script of a story we wish would go away. so what’s the harm in tiptoeing down the stairs in striped pajamas, and red-plaid robe, as the clock chimes half past three? and we are whisked away, by airwaves, to a city built by kings and queens, to gush and sigh as a fairy tale unfolds, and, because we love to unspool the storyline, stitch together broken parts, we imagine, we hope, that at last some part of the empty place inside a prince’s heart is filled, not by the ghost of his long-gone mama, but by the blushing beauty of his bride? it was a good stiff drink of jubilation that came rushing in before the dawn. and all the more delicious because it’s one so rarely poured. and i, among the many commoners, sipped lustily this morn. and pray for peace among us all, as we, scattered here and there and everywhere, join hearts in wishing for a passage of most contented joy. did you take in the wedding? of what did it make you dream?? 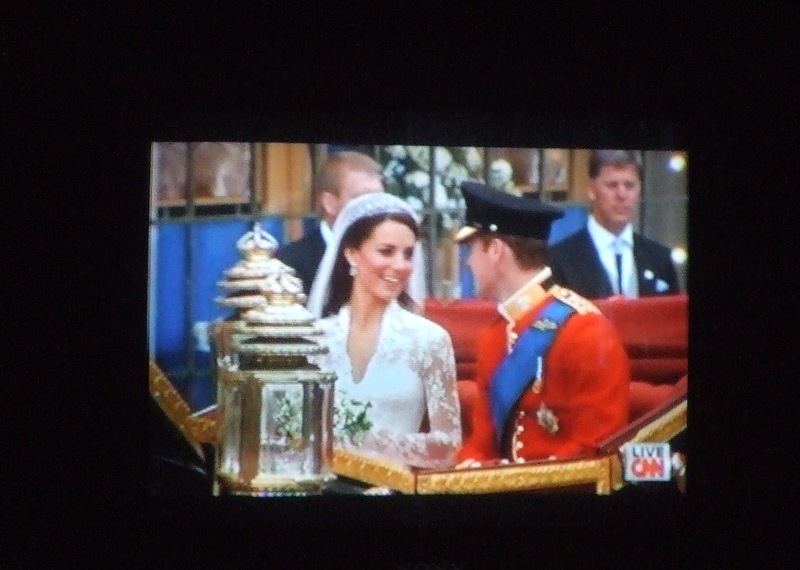 and did you not just love the dress, the lacy sleeves and most especially that demure-yet-sculpted V-neck??? 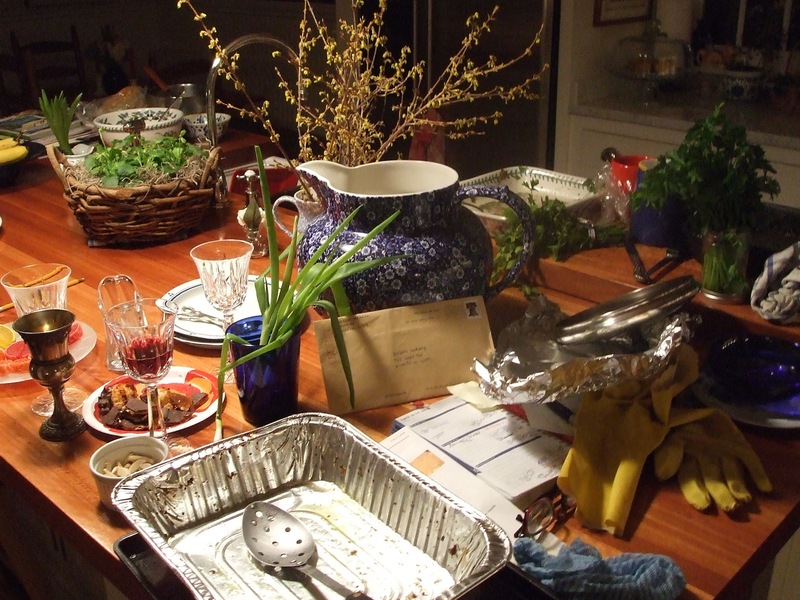 our house this week has been aswirl with all that comes in that holiest of weeks, the week at our house when, so often, passover and easter glide in and intermingle. i’ve been in the kitchen, digging out the pint-sized processor my beloved jewish grandma (the one i’d felt was mine, from heart, if not from birth) shipped to us back when our firstborn was just born, and she decided, upon his birth, that it was the one thing i needed, so she boxed it up in florida to send our way, lest i choose to someday whir the baby’s veggies to a pea-green paste. i made charoset for the first time in years, the apple-wine-and-walnut mortar, the one set upon the seder table, a table we’ve not set here in years and years, but did this year because the rabbi who usually leads us all in chants and jewish mysticism, he’s had a bumpy year and couldn’t manage yet another room of crowded tables. i pulled the “silver palate” cookbook off the shelf, decided after much debating with myself, that the only feast that symbolizes passover for me is the chicken marbella, page 86, the one we’ve feasted on for 20-some years at a dear friend’s second-night seder. and so it is; it’s now our first-night feast, now that i too know how to grind the head of garlic, stir with spanish olives, prunes and capers, an aromatic cloud that filled the fridge for one whole night and next day long. i roasted egg and shank bone. i boiled up matzah ball soup. ordered gefilte fish from the fishman. watched my boys sink in their forks, and smile from deep-down places. and now, with the pantry stocked and freezer too, with foods that have no leavened grain, no grain at all, save for ground-up matzah, we carry on the catholic end of the week, the holy week, the days of awe for me. and while i sometimes find myself in lonely place, alone at church on palm sunday, for instance, i have found in this end of the week, quiet joy, unexpected joy. last night my little one sat beside me at holy thursday mass, the mass that remembers the last supper–a seder, after all. he curled into my side, entwined his slender getting-longer fingers in mine. he asked me questions throughout, and i whispered answers, so quietly moved that for once i was not alone at church. and today, good friday, a day i’ve long marked in silence from noon to 3, in remembrance of jesus on the cross, jesus suffering, my 6-foot-3 rower told me he was skipping practice. why, i asked? because it’s slotted for noon to 2, he said, matter-of-factly, and it’s good friday. i quietly felt a glow. i have not been one to try to wedge my boys into the practice of my religion. i’ve not tried to wedge anything at all. i have offered up all i have. i have made the seders, left out holy books, asked plenty of questions, tried to answer questions without easy answers. we have, every night since each boy was born, whispered a litany of prayers, a head-to-toe veneration and then some, before sweet child slipped into slumber. i have put out shabbat candles every friday. made fish for most shabbats, a subtle catholic-jewish intertwining. i have walked to the lakefront with my boys, tossed bread upon the waves, cast sins at the jewish new year. savored the ritual, felt deep-down blessing at the many roads to the holiest of holies. i have honored the sacred in all its forms. but i have not demanded, not sulked. oh, i’ve shed tears, though, but not when anyone was watching. i’ve felt the price of living in a home where two religions were offered. i’ve felt the sting of their pointed questions, of not knowing if they believed at all. it’s a far lonelier road than most anyone will tell. i have tried hard to make peace with carrying on my quiet flame, believing all alone, of being without my boys on holy thursday night when the time came to take off my shoes and have my naked feet washed by strangers, and to return the blessing all alone. and this year, i am quietly and deeply moved that i was not alone last night, and will not be alone this afternoon in my silent vigil. it is dicey business, this growing up with deep cords of faith, in a world where the secular is drowning out the sacred. it is double hard to try to teach two religions, when there seems barely room for one. it is not wise, i figured out, to demand belief. there is no such demanding. in the end, we can only light the candles, set the seder table, cook fish for each shabbat, revel in the glories of the good times, and pray to God that in the darkest hours, our children will find the seeds that we once planted. and those seeds somehow will swell and burst with the tender beginnings of a vine that someday will carry them to the heaven that surrounds us. that’s my prayer this holiest of fridays. and how do you pass the seeds of faith to your children, or to the ones you so love? it is the antidote to madness. it is portable. and i do believe it shall become a lifelong practice. i started this week. gave it a name. exercised it as often as i could. i call it catching joy. it is living on two planes at once. making sure one side of your brain stays on patrol, and at watch, while the other side goes about its nutty, hair-frazzling business. catching joy practically involves a butterfly net. it is an active pursuit of paying attention. of cloaking yourself in joy when you stumble upon it. of taking that scant slice of soulful delight, piercing it with a fork and sucking the juice right out of it. or, perhaps, slathering it on, whatever the joy is, like a sour-cream-thick slather of makes-me-feel-velvet-all-over. heck, there are days, i am certain, when the bar needn’t be set quite so high. when, “gosh, this is purdy fine here,” is more than good enough. the point, though, is that even amid the mad-dashing, huffing and puffing, there come–unannounced, but regally draped–moments that will, if we let them, feed the pits of our souls, restore the marrow before it runs out. and what we must do, if we intend to understand their essentialness, their necessity, as if pure oxygen inhaled through a tube, is we must not let the lovelinesses waft by without duly noting every last ounce of it. if we can pause, hit the soak-it-in button, well, then i’m certain we can double the bang for our buck. say, for instance, we are dashing across a grocery store parking lot. and there, fluttering by, flutters a butterfly. the first of the season. if we pause mid-lope, if we allow the watchguard side of our brain to shout out in glee, “oh, golly, there’s something wonderful. there’s something to notice,” we might find a new spring in our step, a true gratitude that we happened to be in that place [cracked-asphalt, traffic-jammed grocery store parking lot] at that time [just before anyone at home noticed we were flat out of milk and bananas]. here’s how it went for me this week, once i started to play my new game, the one we’ll call joy catching, or catch joy for short. i found myself stopped at a stop light with two lanes of traffic steering south. suddenly, from behind, i heard a siren shrieking my way. instinctively, as i’ve done since i was a wee little girl, as my boys have seen me and mimicked a million times over the years, i made the sign of the cross, whispering prayers that whoever was hurt would be delivered to safety and wholeness. at the exact same time, in the exact same tempo, a woman at the wheel of the car next to mine, made the same sign of the cross. ditto. in duplicate. it made me smile through two more stop lights that there would be two of us, side by side, both playing out the catholic school girl’s act of veneration and hope, instilled and still knee-jerk after all of these decades. that same day, i do believe, one when my morning demanded i drive like a race car driver, and ferry my firstborn from orchestra hall to a river 10 miles away, i found my car taking a right, when it was supposed to be taking a left (after said child was safely delivered, of course). why, that ol’ station wagon steered itself straight to the seasonal garden store, the one with the cyclone fence and all the red radio flyer wagons. refusing to brake, that ol’ car pulled right into a parking space and suddenly the driver-side door flung wide open. the joys that i caught in that particular outing were the two pots of forget-me-nots, each a cloud of droplets of blue, blue the color of sky on a june afternoon. forget-me-nots, with their delicate emphatic charm, have always been near the top of my spring favorites list, right up there with nodding lily-of-the-valley, and getting-ready-to-burst viburnum, the intoxicant of april and may that soon will explode right outside my kitchen window. there was more joy caught in my net as i knelt in my garden, my knees sinking into the lush, sun-warmed loam, and my fingers brushing back a clump of old leaves to discover the earliest green nubs of the jack frost brunnera i dug up and carried here when we up and moved from my much-loved first garden. again i caught joy when i traipsed into a quirky-but-charming downtown flower shop that’s packed to the rafters with blooms, and walked out with a clutch of hyacinths, muscari and apricot-throated narcissus, now perched in a cobalt blue vase and broadcasting its vernal perfume all through my kitchen. and let me emphasize the power behind it. we have a choice, it seems. we can barrel through our days as if an obstacle course that threatens to swallow us whole, should we make a mis-step. we can be left at the end of the day splayed and gasping for air, numb at the thought of another tomorrow. or, we can punctuate the hours. inject serendipitous whimsy. gather up joy the color of sunshine. we can collect pearls of delight, as if the beads on a rosary. we can hold onto these marvels, turn them over and over–in our hearts and our minds. we can lift each one to the light, and commit their truth to our souls: even on the darkest of days, a scant ray of light escapes from the sun. if we’re blessed, if we’re wise, we understand and we do as inspired: we catch joy, we store it in jars, lined up on the windowsill. all we need do is glance at the sill, to see just how blessed any old day might become. if we commit to the practice, the sacred art of searching and seizing random shards of joy, wherever they come. if we make it the sport of our life. and have oodles of joy jars to show for it. what joys did you catch this week? and before i go, a most blessed birthday to my dear vpk, mother of the one i married, but more than that a bright light and beacon to me and my boys. and to my ella bella cupcake who turned 2 yesterday, you my sweet, are joy caught and held close to my heart, forever and ever. p.s. the beauties up above are from the flower wonderland i wandered into for work this week. oh, what a job. what a joy. caught just for you…. it’s not the first time i’ve felt strung up by my datebook. oh no. not even close. maybe it’s just that it’s worn me down to the rough-sawn bone. it is a modern mother’s dilemma: you write it all down, to get it all done, but when you look at the page, you get dizzy. short of breath. queazy bellied. you look at the calculus there on the page, and you realize it’s an equation to stump even the most enlightened. 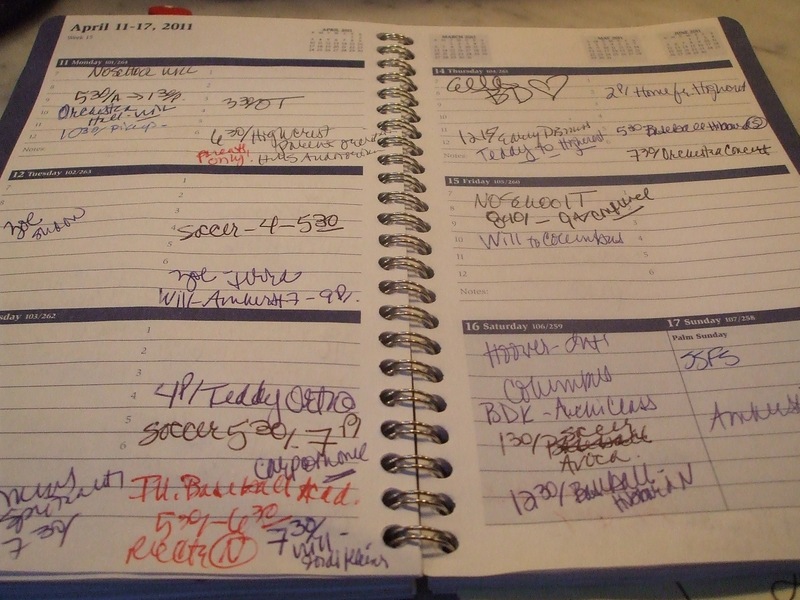 you don’t set out to cobble together a datebook with squiggles and swirls, and multiple colors of ink. you are not trying to illustrate the madness that is your life at the moment. you are simply recording who needs to be where, and when. so how come it makes me so queazy? how come these last two months of the schoolyear, of high school for one of my two, how come once again it feels like a slammer? i find myself whispering to myself, as i drive from place one to place two, “God only gives you what you can handle. good thing, babe, you only had two.” i can’t imagine the scene if i’d had the six or four or three i’d long hoped for. i carried those words with me the rest of the day: just don’t let it be. hmm. and how would i do that? what does that look like? i have two kids. one does two sports plus fourth grade. shouldn’t be too complicated. i have another who carries a nearly impossible load, including an art class that keeps him up till 5 in the morning, what with all the drilling and glueing, the mounting of beach grass in neat little lines, on a rolled-out base of self-hardening clay. and did i mention peculiarly bent tubes of copper? it’s intricate and beautiful. but it scares me to death. say, when he leaves it to dry on the floor of the kitchen, in the space where we walk from one room to another. besides the art, there’s the fine sport of rowing. and a chamber orchestra load that, for instance, has him awake at 4 in the morning to get on a bus to roll down to orchestra hall, for a recording on stage. and i’m due to idle outside, in the no-parking lane, to rush him from end of recording, to 15 miles away, where a boat of rowers will be waiting on the banks of the river. that’s on the docket for monday. never mind tuesday or wednesday. did you read that paragraph there? it’s what’s making me nuts. so i come to the table, to ask: how is it done? how do we take on these loads and not sink under the weight of it, the here-and-there of it? maybe i should have been some sort of a monk. holed myself up in a cloistered existence. worried about simple things, like when the chives were about to burst into bloom. or how much my knees hurt, kneeling there on the hard stone slabs at vespers at 3 in the morning. maybe i was cut out for another life. maybe being a mother in the 21st century is not my natural habitat. maybe i’m driving everyone nuts with all of my worries. and all of my odd calculations, trying to figure how long i can idle in that no-parking lane before the cop blows his whistle, slaps on a ticket? it’s that ol’ nemesis datebook, back to bite me again. i long for the zen. for serenity. for nothing more taxing than gathering blooms from my garden. for snipping fine herbs in my stew. and the sad thing is this: these are the final weeks that my firstborn and i will ride the waves of his everyday life. i’d better figure it out, before i let these days swirl down the drain. i need your counsel and wisdom: how do we take on a jampacked calendar, and not succumb to our worst worried selves? anyone else feel stretched to the point where you hear a snap in your head? anyone know the words to the serenity prayer? it’s like that in spring. one day you wake up with an itch under your skin. you walk outside. you take a deep breath. next thing you know visions of leaf mulch swirl in your head. you think back to that nice lady you met, back in the summer. 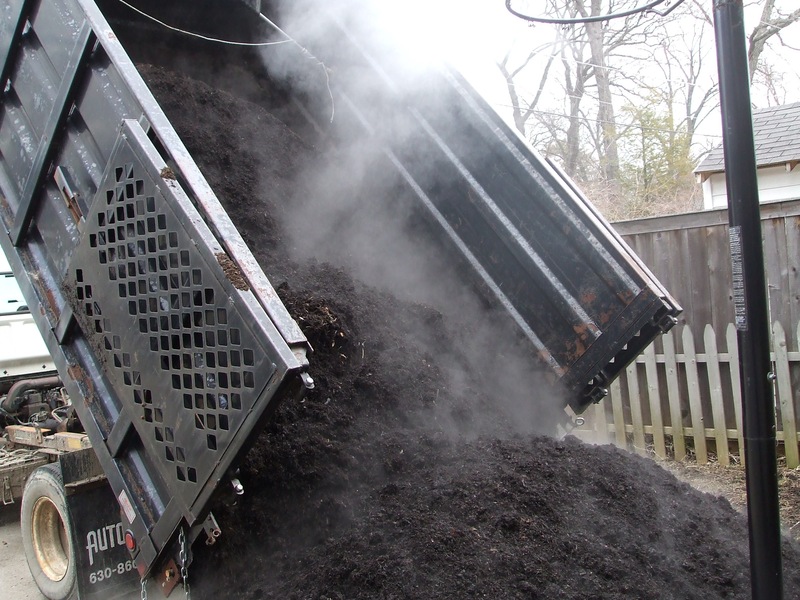 the one who told you the one trick up her gardening sleeve was the dumptruck load of leaf mulch she had poured onto her driveway each spring. how she hauled it by wheelbarrow loads onto her beds, hauled it till her back screamed out in pain. you start to imagine three inches of loam, the earth’s meringue if ever there was one. you imagine your little baby bulbs–the ones with knots of cobalt blue, drifts of white or buttery yellows–pushing up through the crust of the earth. you imagine their soft green skins meeting up with the blanket of loam. you imagine the tips of the leaves, the heads of the stems, all letting out a deep sigh, as they come through from under the earth, and realize the someone who tends this particular garden is a someone who’s looking out for each and every one of the babies. so you start to measure off your gardens, one foot in front of the other, you step and you count. you multiply length times width, come up with square footage. you call the nice lady at the leaf mulch factory. you ask a few questions. you put in your order. you check with your mate who keeps watch on the checkbook. make sure there’s room in the till for this springtime expense. he gives it a nod, bless his non-gardening heart. and so you call back, tell the nice lady to bring on the dump truck. on a morning filled with mist, and promising a whole day of rain, you steer the truck to the parking pad where your earth load will wait for you and the wheelbarrows. just like the days long ago when your brothers chased after dump trucks and earth movers, any sort of construction equipment, you find yourself with a heart that’s pumping in doubletime. because all this dumping and steering is truly exciting. it’s not everyday that your garden chores involve big noisy trucks, with squeaky gears, and moving parts that could crush you. with a nod from you, and an OK sign from the driver, up goes the dumper, and down slides the leaf mulch, all five cubic yards, or the equivalent of 45 bags from the garden store. a cumulus cloud of organic mist rose up from the billowing mulch, the clear and indisputable sign that this mulch was alive, was teeming with all that a garden needs for the whole long season ahead. i couldn’t get to my shovel fast enough. paid no heed to the rain clouds not far in the offing. i heaved and i wheeled. covered a good third of the gardens. then the rains came hard and certain. i shoveled anyway, my whole self covered in mud. i couldn’t have hummed a merrier tune deep inside. it’s what happens to those of us who live to give back to the earth. who find enchantment in the up-close and personal that comes when you’re down on your knees, brushing back clots of whole earth, making room for the hopes and promises, the full-on faith of those green sprouts that refuse to give up over the winter. it’s what happens when the earth begins to stir again. when we begin to stir deep down inside. our heartbeats in sync with the pulse of mama earth who does not surrender, does not give in to the ice and the dark bitter cold. who hunkers down, who holds onto all that matters, who births year after year. 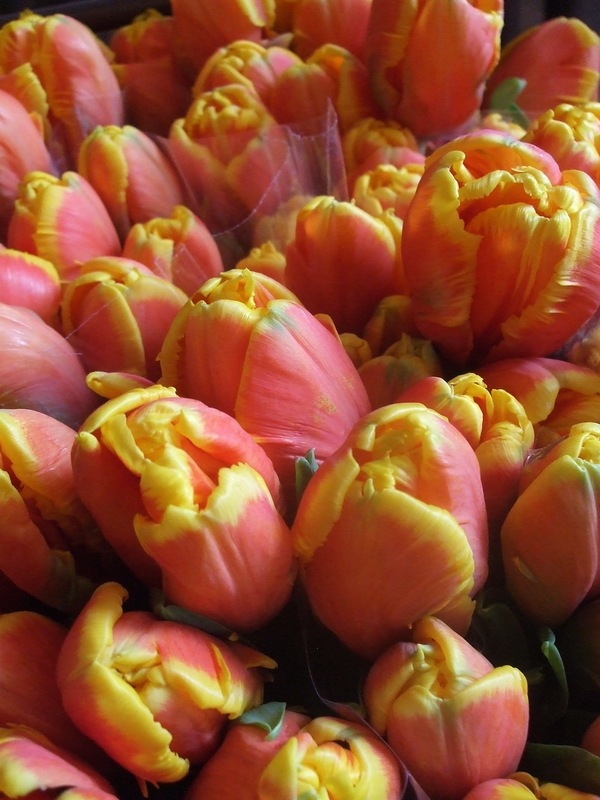 who fills us with bouquets, and swirls of springtime perfume. who paints the earth in the ripest of green. who rewards us for our wheelbarrows of hard labor, of unflagging love. who settles deep and keeps us going forward…..
the rains have stopped now, and a good four cubic yards still wait for me and my wheelbarrow. i’ve babies to blanket before i sleep, babies to blanket, in hopes that they’ll rise from the earth, and wail hallelujah in that song that only the earth knows. it’s spring break here and it’s been heavenly. delicious cupcake was more than delicious, and so were her mama and papa. i got to fly away for four nights and days with my firstborn, a gift if ever there was one. and now it’s home and tending to hearth and garden. i am humming indeed, and headed back out to the mud…..
happy merry april fool’s day.